When I was living in the United States, I didn't see the big deal with cross-platform messaging applications. Like most Americans, I had an unlimited messaging plan and communicated with most people through text messages (SMS). I've downloaded and attempted to use some of the messaging applications that have come out and they all seemed the same. The apps typically replicated BlackBerry Messenger (BBM) and were released on every platform possible. RIM did their best to bring lawsuits against most of the app developers because they all would have the ability to send a message and see when it got delivered and read which is a key feature of BBM. This is probably the reason why people are still using BlackBerry today if it isn't a work issued phone. Since none of these apps provided much benefit over SMS, and would get shut down for being too much like BBM I would play with an app and then delete it about a week later when I realized I hadn't used it since the day I installed it. The major problem with all of the messaging apps, is the fact that you need to convince someone else to use the same app. 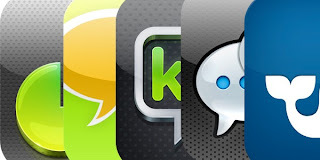 None of the apps would integrate with SMS messages so you can only chat to other people using the app. Now that I have moved to Korea the need for cross platform messaging applications has never been greater. My current cell phone plan is 300 minutes and 300 messages with unlimited data for about $44/month. The price is great for data since you can tether with almost any phone and you can walk around with a mobile hotspot for about $40 cheaper than you can in the US. The problem with that is 300 text messages simply isn't enough. I don't mind the limited minutes because I rarely talk on the phone but since I am a supervisor of roughly 40 people, I need to pass information quickly and to multiple people at once. SMS messaging typically handles that for me as I can text 20 people at once and not have to worry about who got it and who didn't. Since most people in Korea have limited plans like I do, the need to communicate with others makes it a requirement to have multiple cross platform messaging applications. I was briefed by other people here in Korea as well as the employees at the cell phone shop to download a few messaging apps because I'll end up using those the most. Most Koreans use KaKao Talk as their messaging app of choice. I don't see any major benefit of this app versus any other but somehow, KaKao Talk is the one most commonly used. There is no need to review any of the apps since they all basically work the same. They all use some method of letting you know when a message has left your device and reached their servers, as well as when it was delivered to the other phone. All of them allow for some method of customizing the look and feel of a chat along with customized alerts. They also offer transferring of media files such as pictures, videos, and voice notes. There is nothing really special about any of them except for the fact that they are on all mobile platforms except for Windows Phone in most some cases and they are all free to use and save users money by being data only applications. If cell phone plans in the US were more like those used overseas, these apps would be popular in the US as well. But since everyone is forced into $20 unlimited messaging plans, these applications will be popular outside of the US and just a after thought within the United States.